Did Cher Just Support Donald Trump’s Immigration Policy? A recent tweet from the icon caused many to express concern. If you follow Cher, you know her tweets can be messy. Any grammarian’s cold-sweat-inducing nightmare, actually. 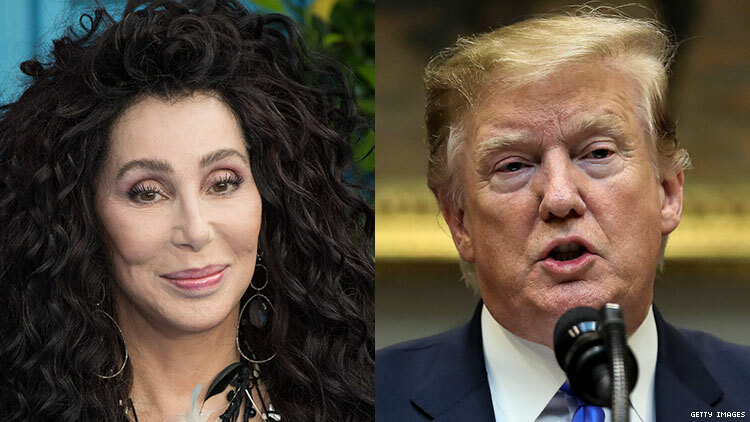 That may be why it came as a shock to so many when Cher appeared, to some, to side with President Donald Trump on his immigration policy over the weekend. Sanders also emphasized that the method is not President Trump’s ideal immigration plan. “We don’t want to put all of the burden on one or two border communities,” she told Stephanopoulos. Cher, who evidently saw the news, reacted on Sunday morning in her stylized caps and vigor. Reading through the replies to her tweet, many expressed concern that Cher was starting to turn to the dark side; there was vague “us vs. them” rhetoric, a seeming prioritization of current Angelenos over incoming undocumented migrants. Unfortunately, even the president saw room enough to frame the tweet as an agreement with his policies. But what Cher is arguing for here isn’t the mass deportation of undocumented migrants, who have been shown to bolster the economy in ways more than one — like contributing more in taxes than they take in government benefits, and helping curb a falling birth rate that poses a real threat to the economy. And, based on a follow-up tweet later that evening, it doesn’t seem like the Mamma Mia! Here We Go Again star is aiming to agree with Trump either. Responding to a Twitter user who identified as a Trump supporter, Cher wrote, “There must be a process.Ppl who are looking 4 asylum,& Qualify,must be given access 2 judges,&properly interviewed. Then They can be sent”EVENLY” 2cities[American Flag Emoji].Not Just THOUSANDS Bussed 2Calif,NY,Etc 4 revenge. These are ppl.WE ARE SANCTUARY CITIES BECAUSE WE DONT THROW PPL 2 DOGS”. This next step was important. If Cher doubled down on the “my city” vs. the undocumented migrants framing, it would’ve been easy to draw a parallel between more Trumpian rhetoric. But Cher seems instead to focus on the desire to maintain Los Angeles’s capacity to serve as a sanctuary city for asylum seekers. And her desire to do so isn’t unfounded. According to the most recent census data, the poverty rate nationwide narrowly decreased from the 2008-2012 five-year percentage of 14.9 to 14.6 percent from 2013-2017. But in the City of Los Angeles, census data currently puts that figure almost five percentage points higher, at 20.4 percent — down from the 2008-2012 five-year percentage of 21.2 percent. According to the Public Policy Institute of California, the number of Angelenos living at or beneath the poverty line is even higher, at roughly 25 percent. The 2018 Annual Homeless Assessment Report to Congress issues similarly dim prospects for the homeless in Los Angeles. According to AHAR, the overall homeless population nationwide has seen a relative uptick in the past two years, since Trump’s tenure in office began. And while only 5 percent of people experiencing homelessness in New York were estimated to be unsheltered in 2018, AHAR’s 2018 report estimates 75 percent of people experiencing homelessness in Los Angeles to be living without shelter — one of the report’s highest estimates in the country. So while Cher’s comment provided a foothold for Trump supporters to argue for a middle ground, one could make the argument that she’s simply trying to bring attention to poor living conditions in Los Angeles in order for that city to continue to serve as a sanctuary city for asylum seekers. We won’t know for sure, though, until she does. And with the election coming up, we can all expect our icons to speak out on issues they find important, like immigration reform.